ቴክሳስ''የቴክሳሣሱ ወገኔ ፤ የሕዝባዊ ወያኔ ሐርነት ትግራይ ምርጫ የቅዱስ እግዚአብሔር ምርጫ ሊሆን አይችልም !ለምን ጨለማን ከብርሃን ጋር ያለማፈራረቅ ሊያኖሩት ይሞክራሉ ? ይህ እኮ የተፈጥሮን ሕግ ለመቀየር እንደ መሞከር ነው። ለምን ነው ሀቁን እያወቅነው ለማለት ስንል በቻ አስመሳይነትን የምናንጸባርቀው ? በእውነት ከክርስቲያኖች የሚጠበቅ ነው ? አባ ማትያስ የአገዛዙን መመዘኛ በሁሉም ነገር ስለሚያሙዋሉ የአባ ጳውሎስን አልጋ የሚወርሱት እርሳቸው መሆናቸውን ሁላችንም የምናውቀው ሀቅ ስለሆነ፥ ይህን ደፍሮ መናገር ነብይነተን የሚጠይቅ አይደለም። በዚህ አገዛዝ ዘመን ''ወርቃማ'' ከሚሉት ዘር ውጭ በማንኛውም ሥልጣን ቁልፍ ቦታ ላይ ወሳኝ ለመሆን ሊቀመጥ መመዘኛውን አያሟላም ! I read all these comments regarding this issue, it looks like a copy and paste comment. we know exactly TPLF's involvment on the election and on other internal issues but I don't like the way you support Abune Merkorios. if this chruch is to be in its worst time after Gragn Mohamed the contibuition is not only Abune Paulos's and Woyane but also Abune Merkorios's too. He was elected and was supported by Derg, all Ethiopia knows this, now he and his supporters are against the government's involvement. this is like when you steal something I call you a THIEF and when I still something I am the best. I think our Bishops have never understood what Jesus said in this word. why is he not appearing in public addressing his messages and blessings? may be this moment would be good for him also. "yegebeya giri giri leleba yamechal". Please check what happened in the Catholic chruch recently, the Pope has resigned due to so many internal bad reasons- I think this is a sense of responsability, I think our Bishops should learn something from this. if we had had such bishops with a sense of responsability our chruch would have been........ Let God and his virgin mother help the chruch. please pray. Geta Eyesus kirstos Medhanialemim eko Esraelawi new wegenoch! Bessiga awo Esraelawi new. Engidi Ethiopiawi amlak liyawm non-tigree felguwa! Are tewu the semayawi new!? YEmishomew hulu yegd and bota mewled alebet. Hulum Amara kilil/Tigray kilil liweledko aychilim. Demo keTigray hizb 95% yemihonew kirstiyan( Orthodoxawi) New ena beprobability hig enquan bnayew, menfesawi abatoch keza yemewtat edilachew sefi new. Kale fetari fekad andach yemihon yelem ena yemimeretew manim yhun man yegeta tewekay new. Bayfekidko geta, eyandandachinin negen layasayen ychilal. Zerna mender kotariwoch ebakachu adeb gizu. Beza lay lela kilil yetewelede yerash zer lihon ychilal. Alyam ante kilil yetewelede yelela zer. Emenegn wedaje manim bishom aymechihm. Ante rasihim bitishom enquan. Yekedemut 5 papasat yeteshomutimko be mircha new. Ante kalawek ei-kenonawi new mallet adelem. Eski yminakewn enawra. Abune mMerkoryosna kesachew yekedemut patriyarkoch hulu yeteshomut bemrcha new. Kemefredih befit yemiyakutin teyk. No matter how it is directed, the so called election is a drama devoid of any spirituality. 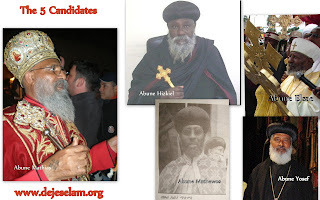 As long as the legitimate Patriarch, His Holiness Abune Merkorios is alive, any election, no matter how well managed and better directed than it is now by the TPLF, it remains illegal. So, who cares about this madness as to who will emerge as the star actor of this drama? It doesn’t matter whether it is Aba matias, Aba Elsa, or anyone. It is illegal and unspiritual per the cannon law of the Orthodox Church. -.... አፍቃሪ አባ...እገሌ ወይም አባ ... ሆነው የሙጥኝ ያሉ..
- "አዎ፤ የስደተኛ ቤተ ክርስቲያን ነው የኛ" ሲሉ..